We transfer, copy and convert VHS video tapes to DVD and Editable File Formats. We also copy S-VHS and camcorder VHS-C video tapes. If you have precious family memories on VHS tapes you will need to get these copied to DVD before the ravages of time makes them unplayable. VHS video tapes have a life of around 30-40 years, depending on storage conditions, which means that many VHS tapes are reaching a critical time in their lives and are prone to failure. Failure is caused when the binding which holds the magnetic coating to the backing film fails. This gives a 'snowy' effect and can cause the video tape to stop playing completely. We normally like around 7 working days to transfer VHS tapes. However, we can do VHS tape transfers within 24 hours at a 50% extra charge. If your video tape has snapped, snarled up, broken or become entangled, we can help you. If the VHS video cassette plastic housing is broken, cracked or damaged, we can help you. If you have VHS tapes in in NTSC format, they will need to converted to PAL format to play on UK television equipment. Conversely, PAL (UK) recorded video will need be converted TO NTSC for use in countries such as Japan and USA . Some of our customers require editable files for editing on a PC or MAC. We normally supply uncompressed AVI files which can play on both systems, bur other file formats are available on request. 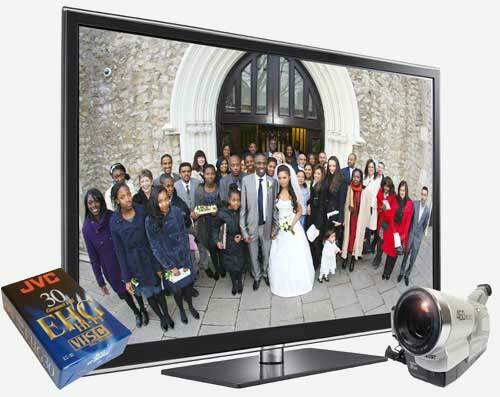 VHS video transfer to DVD costs £20 per Video tape (up to three hours).